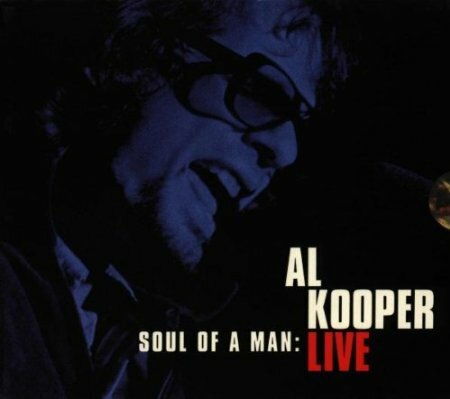 Live: Soul Of A Man is a live album by Al Kooper, founder member of Blood, Sweat & Tears and The Blues Project. It was recorded at The Bottom Line club in New York City on February 4,5 and 6 1994. Kooper is performing with three different bands, Blood, Sweat & Tears disguised as Child Is Father To The Man, Blues Project and his own band, the Rekooperators. I don’t know if he played a night with each or the bands shuffled on and off the stage. On the album, the songs are interspersed without any jarring changes. Five songs from Child Is Father To The Man (all from the album of the same name), four from Blues Project and nine from The Rekooperators. Season Of The Witch and Albert’s Shuffle come from the album Super Session with Mike Bloomfield and Stephen Stills. You Can’t Always Get What You Want by The Rolling Stones features because Kooper played on the original recording on Let It Bleed. This is Al Kooper’s only live album as a solo artist and it is super classy. I don’t know much about Al Kooper which in hindsight is a mistake that I intend to rectify. This is extremely well played and I’d say that Kooper’s singing is fine but sometimes it feels a bit strained and it costs the album a point in my performance rating. The quality of the sound recording is excellent. There’s one mark down on the authenticity scale. After performing at the concerts, fellow ex Blues Project and Blood, Sweat & Tear member Steve Katz refused to have his guitar feature in the recording. His playing had to be replaced in the studio by Jimmy Vivino on the Blues Project and Child Is Father To The Man tracks. I’m giving this a rating of 28 out of 30. That’s 10 for the set list, 9 for the performance and 9 for authenticity. Since the highest mark I’ve ever given is 29, this makes Soul Of A Man one of the finest live albums I’ve ever heard. If you like soulful, bluesy, jazzy classic rock, then I strongly recommend that you listen to the digital samples available on iTunes or Amazon. I think you’ll be as astonished as I was when I first heard it. This is a hard album to classify because it brings together so many different styles from blues, jazz, soul and rock. In some ways, it reminds me of Joe Cocker’s great live album Mad Dogs And Englishmen. I argued that the Cocker album belonged in my “early R&B” category which also includes Rock & Roll. While this is a long way from Jerry lee Lewis or Little Richard, it reflects a time of musical fusion and refusing to accept barriers between different genres.. I can also argue that Live Soul Of A Man is classic rock because that’s another catch all category that avoids the single minded focus of other categories. This entry was posted in 1990s Live Albums, Classic Rock Live Albums, Rock n Roll and Early RnB Live Albums and tagged 1990s classic rock, 1994 live albums, 28, Al Kooper Live Albums, classic rock 1994 by Paul Simister. Bookmark the permalink.